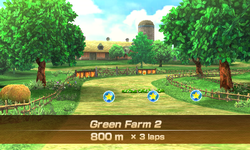 Green Farm 2 is the second track of the Green Farm area, as well as being the second track of the Mushroom Cup in the horse racing sport of Mario Sports Superstars. 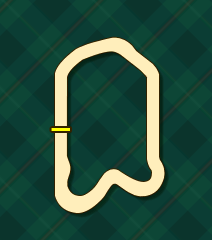 The course has similar aesthetics to the previous track, Green Farm 1, except the layout of the course itself is slightly more simple; the increased difficulty of the track comes from the increased amount of features, such as more hedges, boost panels, patches of grass, and ramps. Trees and taller platforms also make an appearance here, where trees, unlike hedges, cannot be jumped over and must be avoided entirely if players do not want to slow down, and taller platforms require jumps to be ran across to reach higher items. The total distance of the track is 800m, the shortest of the Green Farm tracks, and it shares this length with Cobalt Lake 2. The first turn of Green Farm 2 features a long hedge on the span of the course that every horse must jump over in order to not slow down. On top of the hedge are three stars spread out, where players can grab if they jump at the right spot. Past the hedge is are two dash panels aligned next to each other and three hedges. The dash panels can speed players up, but if players do not jump over the hedges, the speed boost gets mitigated. A cluster of various items can be grabbed just after the hedges as well. On the straightaway of the course where players face south, players encounter large ramps with a cluster of stars on the top, as well as multiple hedges with carrots on top of them to jump over. Past this area is a turn with a dash panel and a carrot on the inner turn and a cluster of stars on the outer edge. On the last curve of the course, players pass by a tree as an obstacle on the inner edge alongside carrots, as well as a higher platform on the outer edge with a cluster of stars on top of it, and then the finish line can be passed. The first turn, featuring a long hedge and three stars. The two dash panels with hedges and items ahead. The straightaway with two ramps, hedges, and items. A turn with a dash panel ahead. This page was last edited on September 10, 2018, at 22:13.